Discover Randy Johnston’s signature approach to performing “It Could Happen To You”, the beautiful composition by Jimmy Van Heusen and Johnny Burke. An insightful masterclass, Randy gives you the tools and tricks to navigate confidently through the song. In addition to learning the standard chord changes, you will also see how Randy reharmonizes the piece to create more movement and color. Randy will teach you how to play a tastefully reharmonized chord melody version of the song. Then, you’ll learn how to combine harmonic minor, diminished, blues via voice-led lines and sequences through the changes of this song. With multiple demos, tons of examples of Randy’s lyrical flowing lines – you’ll be able to learn this song inside out. Equip yourself with these ideas so that you can play this song at your next gig, jam session or recording! Randy’s method to go over a jazz standard is with out a doubt the best that is available anywhere on the Internet! Another plus is the way that He explains these songs ………. It Allows you to use the material over any song! 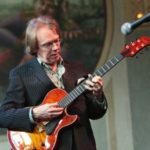 This lesson, like all his lessons includes a chord melody with possible variations, the melody by itself, several examples of single-line soloing, just the right amount of Theory with discussion like what scales he uses and where……. Randy does multiple examples of each category……… Again, I have never seen anything as good as his lessons are here anywhere on the Internet!